As the Executive Director/CEO of the Southern Loggers Cooperative, I take much pride in pushing forward the mission of the SLC which is “Cutting The Cost Of Doing Business For Our Members”! My entire life has been surrounded by logging and the forest products industry. 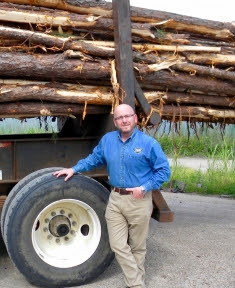 From an early age and especially early in my career, I can remember my father saying to others and specifically to me “If we do not take care of our loggers, the timber industry is going to have major issues in the future!” It sure seems like he was on to something! It is with that mindset that I proudly accepted my position with the Southern Loggers Cooperative in late 2012. Prior to taking this position, I was well aware of the American Loggers Council and what it stood for. Since I was closely associated with past ALC President – the late Travis Taylor and even worked for him for 3 years after selling him my chip mill in Winnfield, Louisiana as his general manager; there was no way that I could not be well aware of mission of the ALC. I have to admit, however, that it wasn’t until after I began my work with the SLC that I truly understood the depth of the amazing work that the ALC does for its members. As I began my work with the SLC and focused on our mission, I felt strongly that we were headed in the right direction as far as furnishing products (primarily diesel fuel) and services to our members to save them money and put money back in their pocket. However, after starting to get more involved with the ALC and its dedicated focus to helping loggers on a national scale, I also recognized that advocacy and tackling issues facing loggers was a way that the SLC could take our mission a step further and indirectly save our members money. Since I knew that the SLC needed to remain focused on what we were good at and that there was no reason in trying to reinvent the wheel, I felt strongly that becoming more heavily involved with the SLC was the efficient way to accomplish that goal for SLC members. The ALC, at least in my mind, were the experts at advocacy for our industry. With that in mind, we quickly upped our sponsorship of the ALC from Iron Sponsor to Silver Sponsor. Seeing and realizing the great benefit that our members were receiving from the work that Danny and the ALC were doing, our board of directors unanimously approved moving our sponsorship level from Silver to the top Platinum Sponsorship. In early 2018, Danny Dructor and I started talking about how the ALC and the SLC could become more closely joined so that members from both organizations could become even stronger. It was obvious that the SLC needed to become not just a sponsor, but a member of the American Loggers Council. With those discussions, the process was started and the SLC officially applied for membership in the ALC. Over the next several months through the membership process and our eventual acceptance as members, Danny and I started brainstorming about how our over 3,000 members combined with the membership of the ALC could become a stronger voice and benefit each other. Well, as you can imagine, the flood gates of ideas opened up and we were off and running. While we realized that some of our membership overlaps with the membership of the ALC, we also knew that there were many of our members that were not members of the ALC through other associations. Now they are members of the ALC through their membership in the SLC which adds benefits and savings for our members and that only makes both organizations stronger. As the SLC moves forward with our partnership with the ALC, it is our desire that members of both organizations will truly benefit. We realize that not all ALC members are members of the SLC due to the fact that we do not have our stations located in their areas (yet). With the SLC’s acceptance as full members of the ALC making all members of the SLC members of the ALC, it makes perfect sense to us to push forward many other benefits and savings for members of both organizations through the ALC as an actual ALC program. The SLC is not about needing or wanting credit for having a program attached to our name, we are only focused on saving our members money and if that is through a combined effort to establish a program through the ALC, then we are all for it! It is the SLC’s desire that ALL loggers, whether a member of the SLC or not, to be successful and we want to help them all cut the cost of doing business. Imagine the buying power that The SLC’s 3000+ members and the membership of the ALC will have as we pitch potential programs to vendors. It can and will be unlimited! So, as the Executive Director/CEO of the Southern Loggers Cooperative, I can safely say that we are proud that we are members of the American Loggers Council and we look forward to working even more closely with the ALC in the future to continue the advocacy work for members and to “Cut The Cost Of Doing Business For Our Members”!